Many moons ago, my good friend Arwen asked me to make her a hat. She didn't ask for anything specific; in fact, she said, "I want it to be a completely inspired hat by you." Now THAT is a project I can get behind! I have to admit... I don't always love making special requests that are very prescriptive, since most of the fun of crochet for me is dreaming up new ideas. Anywho, I noticed some newer cable hats that seem to be crisscrossed so I thought that would be a fun challenge to tackle. Here is some detail... gag, sorry for the dark lighting! 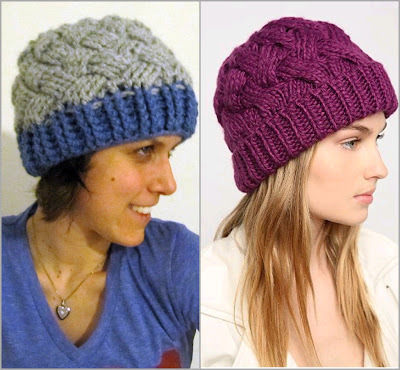 Here is a side-by-side view of the Evenstar crochet hat and a knit crisscross hat from Urban Outfitters. Dang do I look tan... and happy! 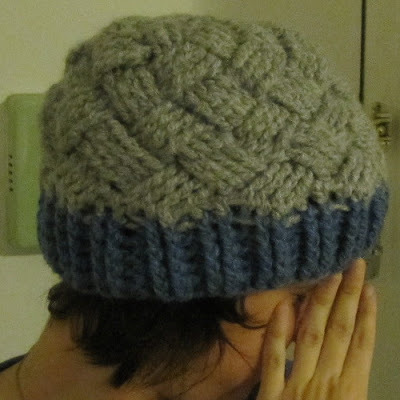 That pale girl looks sad... she wishes she had a handmade Teabeans hat instead. Oh... BTW... suckafish... nobody officially took me up on my barter offer. So I bought it. I guess I know how much a Teabeans hat is worth to you... well I can approximate... and it's less than $26.50 (+ shipping and handling). Just so you know, Teabeans ain't no charity. 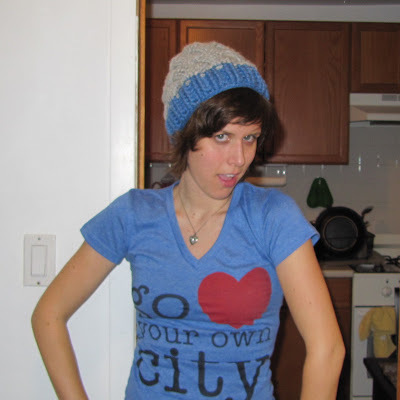 Love you... mean it... and go heart your own city. Ps. Pics of Arwen in this hat to come! Maybe I'm partial, but I think this is the best had EVER.